This week I came across a newspaper article about the potential of the placebo effect. The article quoted Josien Bensing, professor in clinical and health psychology of the University of Utrecht, who argues that instead of trying to eliminate the placebo effect, we should try to use it. In 2010 she published an academic article on the role of communication in placebo effects. Here are some of the highlights of the newspaper article (which is only in Dutch)(1). The placebo effect has been around for a long time. An American anaesthesiologist described how wounded soldiers in Africa in World War II would submit to surgery without any pain killers after a visit of the nurse and an injection of salt solution. They had to resort to these measures because they did not have any morphine anymore. How did these soldiers manage to undergo operations which usually cause a lot of pain, without being anaesticized? That is what Bensing would love to study. The placebo-effect is usually seen as a disrupting factor, for which you should control in scientific studies of, for example, the effect of medication. Bensing argues that it should be the other way around: we should try to reinforce the placebo effect as much as possible, because it inceases the success of the treatment. In fact, the placebo effect is often greater than the effect of the treatment – and it seems to be increasing. There seems to be a lot of potential there! 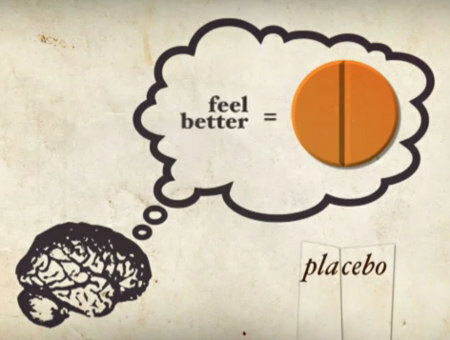 How does the placebo work? We now know much more about the biological workings of the placebo effect, for example through techniques such as MRI and PET. Communication plays an important role in the placebo effect, because Bensing’s research (2) shows that patients find it important that their doctor shows empathy and interest. Patients want to be taken seriously and to be given the opportunity to tell their story. For this reason, Bensing is now doing research on how communication can increase the effect of treatments. In the end, Placebo is not about prescribing a fake pill or a fake treatment, but it is about the way the medical treatment is done. Do the patients get the attention they need and is trust created? Another interesting question is whether there might be any cultural differences in the effect of placebo’s. If communication plays a key role in the placebo effect, then cultural differences might have an impact as well, at least in the way in which the doctor approaches the patient. Any thoughts? (2) Bensing, J. M., & Verheul, W. (2010). The silent healer: the role of communication in placebo effects. Patient education and counseling, 80(3), 293-299.